Galaxy print is all the rage. You can find it in just about any store and I can’t get enough of it! I love all things galaxy or constellation and have spent the last few years experimenting with galaxy prints myself. 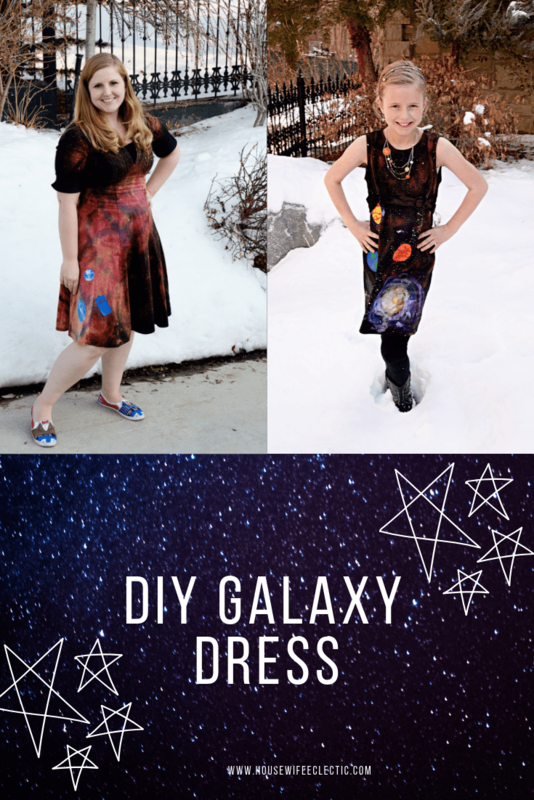 I have made three fantastic galaxy dresses and a tablecloth that I love and now I am going to share my apparel secrets with you! 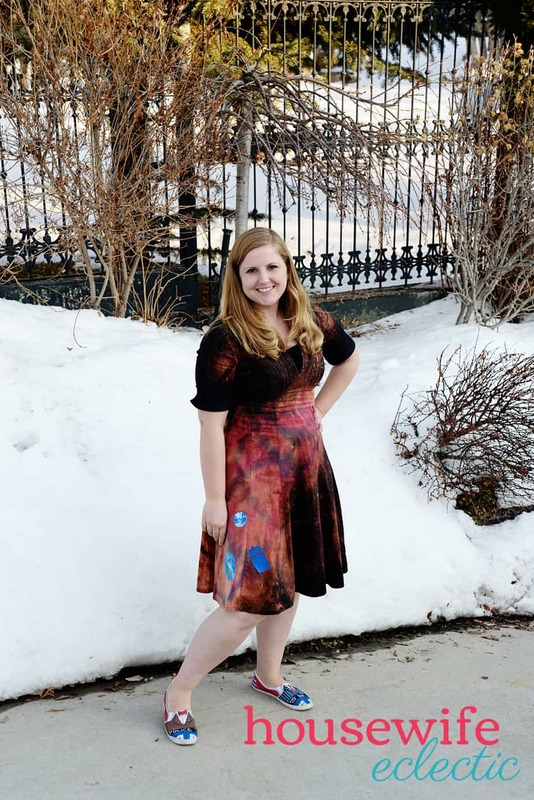 This is the third time I have made one of these Galaxy print dresses and I have loved every one. I do a tie-dye/bleach method for the dresses, but did a spray paint method for a Galaxy table cloth I did, I am not sure how that would work on apparel but it has worked great for our table. You can find the Spray Paint Method here. 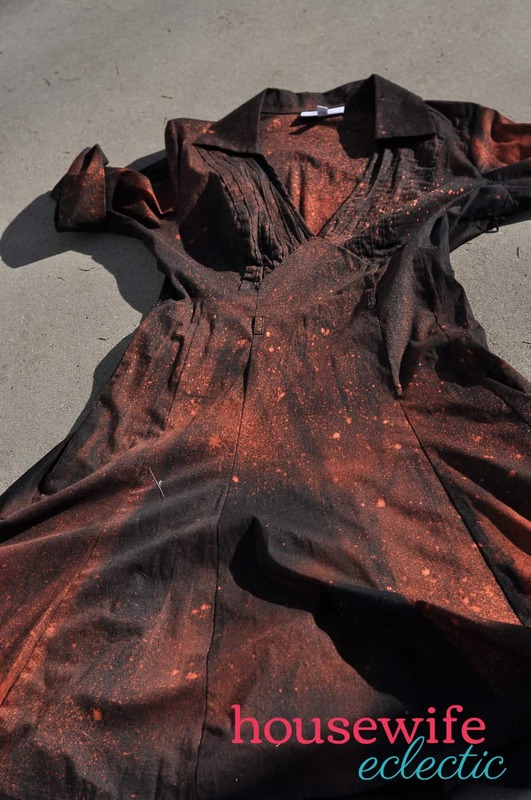 Lay your dress out on a surface that can handle bleach splatter. I usually use the sidewalk. Fill a spray bottle with two parts water to one part bleach and then spray all over your dress. Make sure to spray all over the dress. Pick a couple of areas to highly concentrate your spray on. Your dress should start to turn red, orange and kind of splotchy with the bleach. Wash your dress in cold water with no detergent, just washing out the bleach. 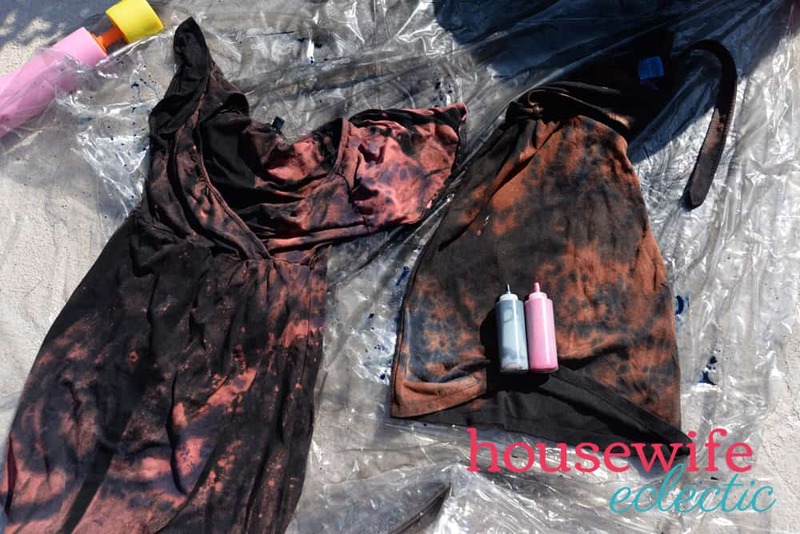 Lay out the dress and swirl hot pink and blue tie-dye all over the dress, focusing on the areas where the bleach has changed the color of the dress. 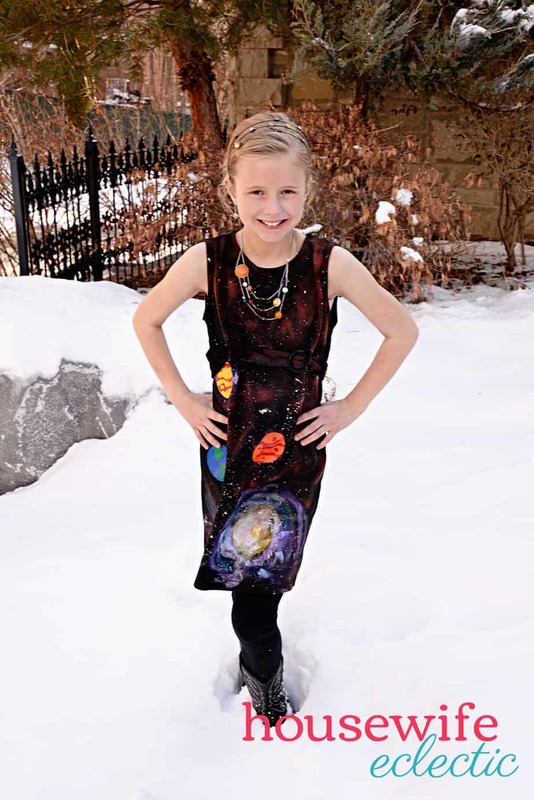 Use an oval template to create the galaxies on the dress. The exact size doesn’t matter as long as you have that nice oval shape. This one is 3.5 inches wide and 5.5 inches tall. 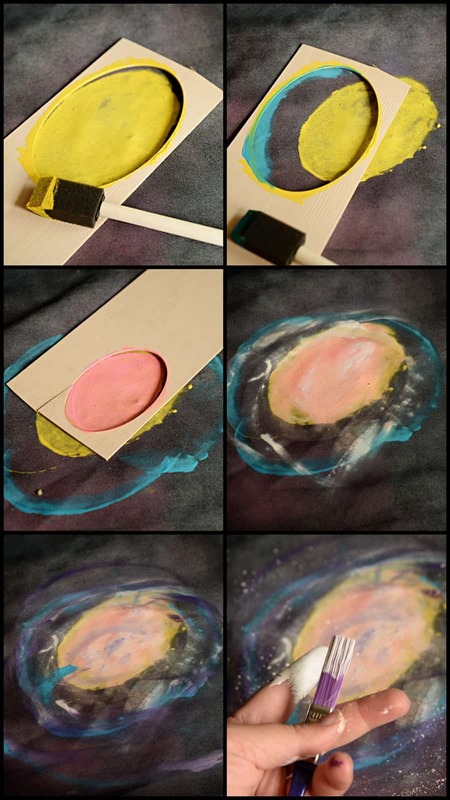 Use the templates to paint the galaxy swirls on the tablecloth. Start with a large light oval (yellow works great for this), add blue curved lines around your oval, using the edge of the oval template you cut out and then make a smaller pink or red oval in the center of your yellow oval. Add white smears to your pink and blue to lighten them up a little bit and then outline your blue curved lines in a dark purple. Dip a paintbrush in a generous amount of white paint and flick the paint all over your galaxy swirl. Repeat this process another time on the dress. Now it is time to add the planets! I have done both paint and iron on planets on different dresses, so I will walk you through both. Cricut has an amazing set of planets already in their system. I simplified them slightly, making each one only two colors instead of three. You can find my simplified versions of the planets here. 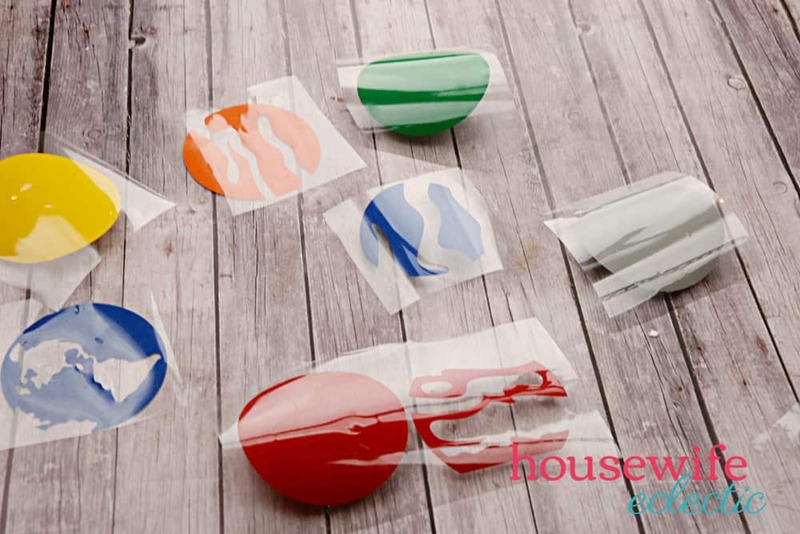 Heat your EasyPress 2 or iron to 305 degrees and apply 30 seconds of continuous pressure on the lower layer first of each planet first and once that is completely adhered, add the top layer, cover the entire design with parchment paper and repeat the process. 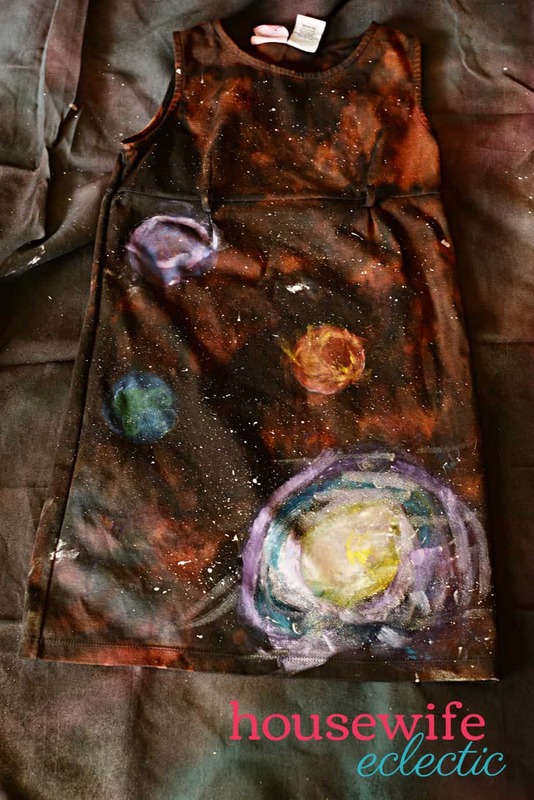 If you want to make paint planets instead of iron on, use a circle template on the dress. Make sure to press the circle template firmly to the dress while painting or tape it down so you can dab colors in a perfect circle. This is part of what will make the circles look like planets. Blues and greens look really good together as well as reds and yellows. After you have applied all of the paint and iron on, allow the dress to dry completely and then wash on gentle. Then rock that galaxy! Would kind of galaxy apparel would you make?